Bill's Movie News and Reviews: I. M. Pei: "First Person Singular" and "Museum on the Mountain"
I. M. Pei: "First Person Singular" and "Museum on the Mountain"
ETV has a DVD of two films by Peter Rosen about architect I. M. Pei: “First Person Singular” (84 min) and “Museum on the Mountain” (50 min) the latter about the Miho Museum near Shigaraka Japan, (website url) link . The two films are shown full-screen. The first film is essentially Pei’s autobiography, through his interviews and commentaries on his buildings, such as the Pyramid entrance to the Louvre in Paris, which I visited in 1999, and the Rock and Roll museum in Cleveland. He also designed the new National Museum of Art in Washington. Pei was born in Canton, China and raised in Shanghai ("the Venice of China") and Hong Kong long before Communism. There is a certain self-focus suggested by the title, reminding me of the character Howard Roark (v. Peter Keating) in Ayn Rand's "The Fountainhead" (itself a rushed movie in 1949). The film makes heavy use of the music of J.S. Back, especially the D Minor Toccata and Fugue, as some music from various suites. The "gebrauchmusik" of Paul Hindemith ("Matthias the Painter") also appears with effect. The second film chronicles the building of a huge museum in Japan, where the top of a mountain is removed, and then replaced above some of the building after completing. That sounds like an odd commentary on the practice of “mountaintop removal” in mining coal, already covered on this blog. 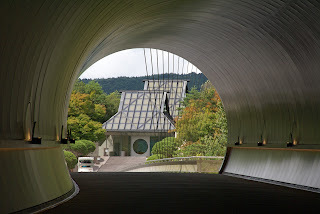 The museum also has a long pedestrian tunnel through the mountain, and an unusual suspension pedestrian bridge. The films can be compared to “My Architect” (2003, New Yorker and HBO), about Louis Kahn, directed by illegitimate son Nathaniel Kahn, and featured when Landmark Theaters opened its E Street Cinema in January 2004 in downtown Washington. Another comparison could be made to “Sketches of Frank Gehry” by Sidney Pollack (Sony Pictures Classics), which included the Guggenheim Museum in Bilbao, Spain, which I visited in April 2001.